We use microbial inoculants because we generally need to increase the diversity and number of soil microbes in our soil food web. That’s because of low organic matter, insufficient water, pesticides and chemical fertilizers, tilling, pollution and other toxins. You can do this throughout the year, and one of the best times is while you’re planting. Compost helps, but more concentrated microbial inoculants offer additional advantages – they’re easy, inexpensive, provide specific beneficial microorganisms, and some of them can be applied to plant leaves to inoculate the leaf surfaces. In the Smiling Gardener Academy, there is a whole section on a few different microbial inoculants. Today I just want to mention the main 2 you might want to use at planting. Mycorrhizal fungi is the first. They are among the most important microbe partners of plants, and an inoculant should be applied during planting when it’s possible to get the spores on the roots. They bring all kinds of benefits to plants. Effective microorganisms (aka em 1 microbial inoculant, or a good similar product is scd em) is a liquid mixture of very important microbes. It’s my favorite inoculant and I use it all the time with great results, which is why I spend so much time on how to make your own from a mother culture in the academy. Update: 2 years after creating these lessons, I decided to start selling these inoculants, so you can now learn more about them here: mycorrhizal fungi and effective microorganisms. Feel free to ask me any questions about mycorrhizal fungi or effective microorganisms down below. Applying effective microorganisms back in 2008 – a hose end sprayer works best. The next thing on my list is bringing in microorganisms, bringing them into the soil. And that can happen all throughout the year. And really should happen throughout the year. But one of the times it should happen is when you’re planting. And, we do this with compost is one way and compost has advantages, but so do some of these technologies that are coming out in the last 20 years – and especially the last 5-10 years – are more concentrated products that are very inexpensive and easy to apply. We can bring in sometimes very specific microorganisms that we need, and some of them we apply to the leaves of plants and you can’t do that with compost. It’s so beneficial to get microbes onto the leaves of plants. So I love microbial inoculants and I have a whole section on them in the Academy, but today I want to just show you two of my favorites. And the first one comes in a bag like this and its called mycorrhizal fungi. You may have heard me talk about it before. It is an extremely fine powder, even finer than the rock dust I showed before. And what it is, is a bunch of spores of this special kind of fungi, this mycorrhizal fungi that forms a relationship with the roots of most plants in nature and in our organic gardens. The fungi go out into the soil and bring water and nutrients up to the plant and then the plant gives food to the fungi in return so it is this symbiotic relationship that happens. In our vegetable gardens the reason that we’re bringing in things like compost and fungi and the next thing I’m going to show you is because they are often lacking just like the organic matter is often lacking. Because of tilling, pollution, chlorine in our water, if we’ve been withholding organic matter from the landscape by raking out the leaves and taking away grass clippings. Certainly pesticides, chemical fertilizers, general pollution and toxicity, monocultures, all kind of reasons. We don’t have the microbial diversity that we used to or that you would find in an untouched field or forest. So the mycorrhizal fungi would be there in a forest but they may not be there in our organic gardens and so we bring them in very inexpensively. What I’ll do here is for example, parsley, I believe is quite a big fan of the mycorrhizal fungi. And all I need is that much, like less than a teaspoon. And I don’t really even have to worry about getting the whole plant, I just kind of rub and it gets on there and eventually the fungi will go all over the place and that will be great. So that is a really amazing way to help this plant get the nutrients it needs. These fungi, they are going to form a relationship right there. And it’s a special kind of fungi that do that and you can by a pound of this stuff for, maybe around 25-30 dollars, depends on the brand. So, that’s mycorrhizal fungi. The next one which you may have heard me talk about before because it’s my absolute favorite it’s called effective microorganisms (EM). I get into this big time in the Academy and this is a liquid culture of very specific fermenting microorganisms like lactic acid, bacteria, and saccharomyces yeast and certain photosynthesizing bacteria in very specific proportions. So this is made in a lab as a mother culture and you can actually make your own from that mother culture and activate it like I’ve done here. What I’m going to do is I’m going to water these plants in, with this mixed in quite a lot of water like a few hundred parts water. So I get into this big time in the Academy and this is kind of a good example of the kind of people who would like to go into this Academy. As I’ve said before it’s not really for just kind of average gardeners who want to keep up with the Jones’ is something that I say sometimes. It’s really going beyond the Jones’. It’s for people who are really passionate about it, like I am. And who would be willing and totally interested in learning how to take a culture of microorganisms and mix it with molasses and water and some other stuff and ferment it for awhile to make your own incredible microbial inoculant for your organic garden. So this stuff is just so exciting to me. It’s just for people who are willing to do some of the stuff I’ve been showing you in these videos but even in more detail. Willing to put in a little work up front to get the benefits of your goals. My goals are this huge vegetable garden I have all around here that’s free of pests and that’s a really inspiring place to be, those are just my goals. So effective microorganisms em is a big help in that and the other microbial inoculants are, too. In the next video I’ll talk a little bit about how I’m going to maintain this organic garden I’ve just planted here and the effective microorganisms comes in there as well. This is very interesting. How much does the EM “mother culture” cost? The mother culture generally costs $22-32 in North America for 1 liter, and from that you can make 20 liters, which goes a very long way. Hi Barry, activated EM is not aerated like compost tea, other than perhaps for the first couple of weeks if you’re doing a longer brew cycle. In that case, you’re right, the aeration should be gentle. Most of the process, however, is a fermentation, without oxygen, just like wine. I like to put the juice from my bokashi compost in my aerated teas. Hi Phil,Is it the first year that your are using EM or Bokashi in your garden?Can you see a difference in the quality, in the taste, in the quantity or fruits and vegetables harvested this autumn? I’ve been using EM/Bokashi for 6 years. In most gardens, I see a positive difference in all of these 3 things, but generally only after using the EM regularly throughout 1-2 growing seasons. Occasionally, it doesn’t seem to make much difference, probably because the microbes in EM are not the limiting factor in those gardens, but it never hurts and usually helps, sometimes tremendously.I’m also at an advantage because I used to sell it, so I had the benefit of getting a lot of good feedback from customers about how it helped their gardens. I find EM to be very inexpensive after activation – less than $2 per quart. But definitely indigenous microbes is a great way to go, too. I don’t see it being quite as valuable as EM, but definitely still valuable and arguably slightly more sustainable. Hi Mike, Christina at http://www.gardenerspantry.ca (my old business) in Victoria will ship to you quickly and inexpensively (Canada only). Hi Phil. I love your videos they are packed with great info. I am really new to gardening (just started this spring.. and my first crop didn’t do well). I built a raised garden because the soil here (Arizona) is so poor. Are there dissadvantages to a raised bed? I am finding that i wish i had a bigger area to plant in. Do you think that if i took down my raised bed that my crops could still do well in the soil we have here? It’s definitely possible to improve poor soil and grow crops in it. It can take a bit of time, but I know you can do it. I don’t know your setup, but I would tend to continue using the raised beds you’ve created, as well as trying to work with your existing soil in other areas in order to expand the size of your garden. There are some advantages of regular beds over raised beds, but it’s nice to have both. Don’t get too big too fast, though. It’s fine to start small. Phil,Any thought on Garden-ville Sea Tea? It’s difficult to tell from their lack of detailed information on it. I get the impression that it’s definitely not the highest quality product out there, but I bet it would be beneficial to use in the garden. But Phil- for big gardens this can get into a lot of money and there are so many things to add that are just around us. if we eat organic, we can compost clean garbage, but the value of coffee grounds and egg shells is amazing. Tell them about epsom salts for the magnesium, and my brew of fish scrap, yeast, molasses or powdered sugar in a pinch with beer bubbles beautifully. Makes a lush garden.And, when you say inoculant, what about the dry mix they sell in spring for legumes like beans where you went the seeds and drop them in the powder and plant? All good points, but I would only very rarely use epsom salts, only if I had a major magnesium deficiency. And in terms of money, EM is probably the least expensive thing to bring into the garden when you take the time to activate it. Extremely cost effective, even for whole farms. And yes, legume inoculants are very helpful, too. Hi, All the best intention in the world for Organic gardening is wasted if we use GM seeds. (Genetically Modified). Regards, Barry. Barry, I’ve often wondered about this. How can we tell from a simple packet of off the shelf seed’s whether or not they’re GM?Cheers Ben. Hi Ben, organic seeds are not genetically modified, so just go with organic (for that and other reasons) and preferably heirloom. Hi Phil,Can you give me suggestions as to where,commercially, I can get my garden soil tested? I tried it with the local extension service through Virginia Tech but was very disappointed due to the lack of organic options. Their advice was to add 10-15 pounds of lime per acre. nothing about any soil defecincies! Help! Definitely, I send my to Crop Services International, or sometimes International Ag Labs. Hello again, Phil, Is there a quick way you could explain the difference between the MF and EM? Do they have the same general purpose and function, but are just different forms? I’m into human food and beverage ferments – is there comparison to human ferments to help me understand it? Is EM like kombucha for the garden? And MF powder like taking a probiotic capsule? Or am I way off with that analogy?! Thanks! Hi again Heather, they’re both kind of like probiotics for the garden, and they both provide many of the same benefits and some different benefits. They are very different organisms, and it’s optimal to have both.Mycorrhizal fungi are special fungi that form relationships with the roots of most plants in the garden. It comes as a dry powder.EM is more like a mixed probiotic with different species of fermenting microbes, mostly bacteria. It’s more like kombucha. It’s a liquid that has lots of lactic acid bacteria.So we really want them both if possible. If you just wanted to start with one, I would suggest EM. Thank you, Phil. I have been watching your videos and learning so much. In my small urban garden, the only water available is from the tap – and yes, it is chlorinated. Oh well, luckily it rains quite often, so I don’t need to use too much piped water (and chlorine). The important thing is to be as organic as you can.I am planning to get my mango tree pruned next weekend. I have been told to apply some weather shield paint on the ‘wound’ so that pests and fungi don’t creep into the tree through it. Do you think this is advisable? Are there better alternatives?I would really appreciate your ideas about this.Thanks once again. That’s really bad advice. None of the good arborists are using any kind of tree paint anymore. Personally, I would spray the wound with compost tea or effective microorganisms, and I would also prune as little as possible. But overall, a tree knows how to heal itself. Hi, Phil! One of your posts raised a question I would like to ask you. You had mentioned that sulfur kills microbes. We have alkaline soil here in central Utah. I was told that sulfur will help to change the Ph of the soil, making nutrients more available to the plants. Would you advise sulfur for that reason or not? I’ve been wanting to go for the sulfur found naturally in things such as garlic & horticultural molasses. Does that form of sulfur kill beneficial microbes? I notice that the molasses is one of the ingredients in aerated compost tea, as a food source for bacteria, so I am a little confused. If Molasses it kills microbes then why and how can it be used to fed the microbes? As in worm tea, compost tea and to activate EM 1to name only 3. Frank. Hi Frank, that’s why we buy unsulfured molasses, because it’s good for microbes. Hello Phil. I just purchased a 32oz bottle of Dr. Higa’s Original EM1 Concentrate (Microbial Inoculants). 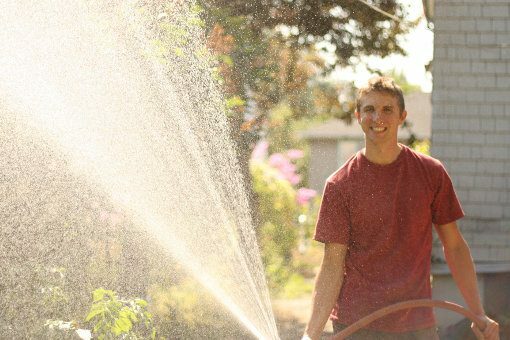 – Should I “activate”before using or simply use solution diluted using a hose sprayer? – If I should”activate first, how should I apply and how much. Sorry to have suchbasic questions but just getting started with organic growing. Sorry but when I click the link above it states the page has been moved? Thanks for your time! Strait from the bottle that should be interesting to see. Barry. Sorry, Butch, this message slipped by me last month. I mostly apply EM with a hose-end sprayer. A backpack sprayer would work, too. Even a watering can works in a pinch. I spray it on the plants and on the ground (on my mulch) and lawn. When using a hose-end sprayer, I go for a 1:500 ratio of EM to water. In a backpack sprayer, that gets too be too much water, so I go more like 1:200 or 1:100, but I prefer 1:500. I just did an on line converter to help me out on the ratios here. If I put 1 teaspoon of EM in a container, I would need 10.4 cups of water to make it a 1:500 ratio. And 2 teaspoons would make about 21 cups of water or roughly 1 1/3 gallon of water. This kinda helps me figure out a bit better how to do the proportions. Cover crops would be great over winter to improve your soil. Mulch is always good. Microbial inoculants can be purchased in many places. I don’t have a particular vendor to recommend here, but you can research online. Hi Phil, I really didn’t know where to post this, so I’ll do so here. Do you have any recommendations for fugus infects, such as black spot, etc. I have a lot of vinca major as ground cover (my land is sloped quite steeply in some places) and the fungus starts there and seems to spread quite rapidly elsewhere. Thank you ahead of time, I would appreciate any advice you could give even if it’s just direction to look. I don’t do much of any spraying for fungus, since I focus on improving soil and plant health in order to combat it, which is obviously a bigger process than can be explained here, but it’s ultimately what my 15 lessons are all about.And you should definitely try the baking soda recipe in the first lesson of my ’15 free lessons’. Hello… I like very much your program because I’m practicing urban organic in our rooftop here in the Philippines. May I just ask if the mycorrihzal fungi is good in organic hydroponic technology. Thank you very much. Yes, I use the fungi in hydroponics, too. we are beginners to gardening. we just planted few creaper cucumbers melons , hot peepers tomotoes in our garden last year. they were plenty of them we kind of kept giveing them away for all our friends. we did not know anything about soil test and nutrients in the soil. we just added mixture of 2 topsoil + 1 peat noss + 1 cow manure.but after reading your material we want add some nutrients to the soil before sending it to test. as you mentioned the glacial volcanic rock dust and calcitic lime.when we were searching on line the price was so much just for the shipping. is there any source to buy these in NJ , PA areas , so we can go and get them with reasonable prices. please reply. I’m sure there are sources near you, but I don’t keep track of all the places to buy these in the U.S. You’ll have to do some research. You’re right – it’s too expensive to ship them. If you want to avoid genetic modification of seeds, I’d avoid anything marked “hybrid”. What I’m concerned about is contamination of our gardens from chemtrails where in my area they are out spraying aluminum, strontium and barium several times per week. How is everyone protecting their gardens from this? It makes me want to cover everything up but I don’t even know if that would do any good. Hybrid is very different than GM – there are organic hybrids that are okay to use. Hi, I’m enjoying your videos very much, but does this concerns to any kind of planting, I don’t have to much space, so what about container gardening, and also I live in Puerto Rico can I apply all of this concepts here in PR? Absolutely! Microbial inoculants and most other topics I discuss are important for containers, and they all apply to Puerto Rico. I purchased EM 1 microbial Inoculant from a TeraGaix. Can I use it and grow more as you instructed in your video? buy using black strap molasses and water? Phil thank you, for your advise about microbial fungai , the very next day I found it at Lows store . I am dong winter gardening here in Nothern California (Stockton) and applying it as I plant. Pete Singh. Ya, it won’t hurt them at all. Good idea on the filter. Just make sure if your water has chloramine instead of chlorine (check with the city or search online), that your filter can remove that too. Would using kombucha scobies or kefir tea be good microbial sources for the vegetable garden soil and plants also? I have both available in plenty. Yes, it’s worth using. Even just plain old lactic acid bacteria can provide some benefits. Hi Ravi, I’m not sure how the bio gas unit works. Can you explain more? Hi. I have a round compost with a hole on the bottom where all the liquids drip into a holding thank. I use this liquid mix with water to water my plants. Is there something else that I could add to my compost to make this liquid even better. How about molasses? You generally don’t want to add a sugar source because it will encourage the microbes to eat it rapidly, thereby consuming most of the oxygen in the leachate (the liquids), which makes it anaerobic, which encourages a microbe population that tends to cause problems for plants. Adding some EM on the other hand ( https://www.smilinggardener.com/sale/effective-microorganisms-and-scd-probiotics/ ), would be an excellent idea because it will encourage the beneficial microbes to inhabit in the liquid. Actually, I would strongly recommend that product for your situation. Hope that helps! Thanks so much for sharing. I’ll start my garden soon as the weather clears up here in NJ. This EM that you are talking, is it not available in plenty in compost tea (once you bubble plenty of air at least for 24 hours)? If you make good compost tea, you will probably have most of the microorganisms that are in EM in your tea, but what makes EM special is the quantity and proportions of those microorganisms, so it’s useful to use them both. How do you judge the quality of compost tea? For example, one day you may make compost tea using molasses as the feed and bubbling for 24 hours, another day you may use jaggery and bubble for 36 hours. How do I know which is better in quality? In our place people ferment ground nut cake / neemcake / mustard cake for 7 days and use this solution after diluting. It is an anaerobic process, so the microbes will be entirely different. How does itcompare with the compost tea? If you send it to a lab for testing, what are the detailed break up you should ask for? Hi, Without a Microscope you cant tell anything. Even with a scope you have to know what you are looking for. Barry. without a scope you can’t tell how good it is.